Ever dream about being a much better mandolin player? Look no further! This Cheat Sheet provides you with basic neck diagrams for major sales, minor scales and arpeggios: all you need to refresh your memory and get back into the swing of playing mandolin. 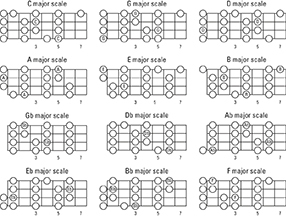 The following diagrams include all 12 major scales in first position, using open strings whenever possible. The circle that includes a letter indicates the root note or tonic of the scale. Notice that these scaled do not start or stop on the root note but include all the possible notes in the scale in first position. If the scale sounds strange at first, try playing only from one root note to the octave or next root note. Once you have that down, play around with the entire scale. 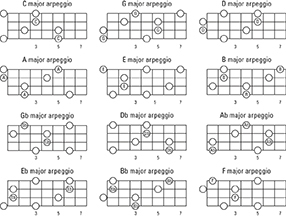 The following diagrams include all 12 harmonic minor scales in first position, using open strings whenever possible as you play the mandolin. 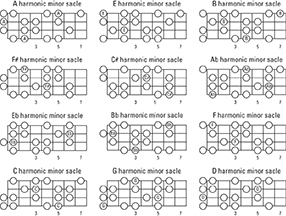 Be mindful of the minor third or three fret gap between the sixth and seventh steps of the harmonic minor scale. Once you’re comfortable with scales in your mandolin play, the next step is to start working on your arpeggios. The following neck diagrams include all 12 major arpeggios in first position, using open strings whenever possible. 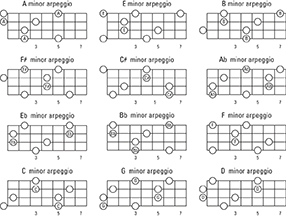 Along with learning your major arpeggios for playing the mandolin, you will need to know all 12 minor arpeggios. 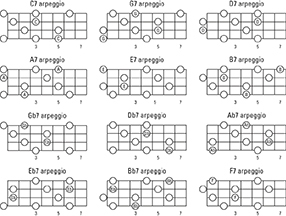 The following diagram shows all 12 minor arpeggios in first position, using open strings whenever possible. Dominant 7th, or more commonly called 7th arpeggios, are a type of arpeggios that you should know when playing the mandolin. The following diagrams include all 12 dominant 7th arpeggios in first position, using open strings whenever possible.